Welcome to the Conference Championship round edition of Snaps, Pace, & Stats, where we examine trends in snap totals and no-huddle usage. It is meant to be a 30,000-foot view of upcoming games, with the goal of identifying which matchups will – and which will not – be played on fertile fantasy football soil. The fantasy fertility of our Conference Championship games is not in question. Kansas City hosts a rematch of a Week 6 game with the Patriots in which 83 points were scored. The Saints welcome the Rams for a rematch of a lower-scoring matchup that saw only 80 points. If the Chiefs and Rams prevail, we’ll see if they can match their combined 105 points from Week 11. With two prospective barnburners on tap, do we just “play all the guys,” or can we at least draw some play-volume-based distinctions between the teams – or even the games themselves? There is a difference in DFS ownership shaping up due to reports of nasty weather in the night game. While extreme cold has an effect, on average, there remains enough variance in performance projections to potentially outweigh a sizeable effect on ownership stemming from any weather-related fantasy freakouts. On a tiny two-game slate, any scenario that allows low-owned access to the league’s most explosive offenses is worth a long look. When the Rams and Saints met in Week 9, they waged a back-and-forth affair in which New Orleans finally took the lead for good halfway through the fourth quarter. From a snaps pace and play volume perspective, they had control long before then – not that it seemed to matter as Los Angeles scored 21 unanswered points to tie with under 10 minutes on the clock. Will the Rams change an offensive approach that saw them throw on 68% of situation-neutral plays that day? It was well higher than their 58% seasonal rate and came when a now-injured Cooper Kupp still occupied a significant chunk of the game plan. It would almost certainly slow the game’s pace if they do, and Los Angeles just smashed the smash-mouth Cowboys with a playoff-high 58% run rate and 273 rushing yards. The thunderously explosive and thunderously thighed duo of Todd Gurley and C.J. Anderson stand a better chance with the Saints missing stud tackle Sheldon Rankins. New Orleans’ ascendant defense grades third-best in run stopping and allowed the second-fewest yards per carry. They have been one of the league’s most prominent pass funnel defenses, even as their coverage stiffened and pass rush progressed. Opponents threw on New Orleans at the fifth-highest rate during one-score games this season (60%) – a rate the Eagles easily surpassed against them last week (67%). The Saints remain weak in the slot, and Kupp’s absence has created opportunity for Robert Woods (81% slot rate versus Cowboys). Will the Saints offense repeat its 46% situation-neutral run rate from Week 9? It was a few ticks higher than the 43% seasonal rate that saw them rank 15th-most run-heavy in one-score games. While New Orleans threw for 346 yards in their last meeting, 141 more came on the ground and helped keep the Rams honest. 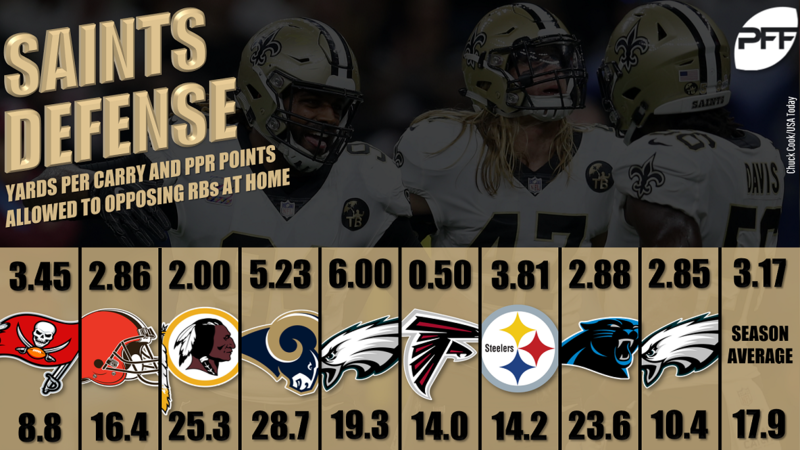 Despite the elevated run rate, the Saints operated at a quicker pace (28.9 seconds per snap) than their seasonal rate, which ranked fifth slowest (30.3). If their ground game is not sufficiently successful, Sean Payton will have no problem turning to Drew Brees – which would be a positive for play volume. Los Angeles was run on at the 12th-highest situation-neutral rate this season (44%). They had the 17th-highest-graded run defense before rising up at home and holding Ezekiel Elliott to 2.4 yards per carry. It was the first time in 30 games with at least 20 carries that he averaged 2.5 yards or fewer. Of course, that stoutness may not travel to New Orleans, where Payton has a healthier interior offensive line and won’t call the same runs as Scott Linehan. Either way, absolving the Rams defense of allowing the league’s most yards per carry seems hasty – especially when any weakness there could easily submarine the contest’s play volume and pace. Los Angeles operates a faster offense when games are close – the same as they did last season. To a lesser degree, New Orleans does the same thing. The difference is the Saints are far slower when they are not in neutral game situations. The longer the game remains competitive – and New Orleans is only a field goal favorite – the faster we can expect the pace to be. While Rams games averaged a middling number of combined snaps (16th-most) and the Saints ranked 21st, a significant portion of their contests were not played in neutral situations. It is also reasonable to expect these teams to treat modest leads as they would a neutral game situation, particularly after the Rams roared back from a daunting deficit the last time they were in New Orleans, and the Saints showed no fear of being down by two touchdowns less than a week ago. Both offenses have demonstrated they are more than capable of operating at an elevated pace, scoring quickly, and in a variety of ways. Of the two championship round games, however, this is the tougher matchup to project from a play-volume perspective. Freak weather forecasts aside, it is almost certainly the more likely matchup to have a depressed pace. While a full fade is impossible on a two-game slate, it’s prudent to be selective when picking fantasy options from the early game. We will operate under the assumption that the early-week doomsday weather forecast of an “artic blast” is being overhyped. Although the over/under is diving as fast as the temperature supposedly will, pretending we know its actual effect on this specific matchup seems foolish. We do know that weather hysteria has made betting the “over” in these situations exceedingly profitable. The Patriots have played two playoff games during the Bill Belichick era in sub-20-degree weather, and although one saw them throw less (42%) than their seasonal average (49%), the game that hovered around zero degrees saw them throw more (60%) than their seasonal average (55%). Their first touchdown was a 41-yard rainbow to Bethel Johnson, as the crowd’s beers oozed frozen slush onto their shoes four minutes after kickoff. This year, the Patriots produced 75 plays and 43 points during their Week 6 classic with the Chiefs. Fortunately for them, it was played in New England, where they’ve shown extremely favorable home/road splits. As is their custom of late, Kansas City only needed 53 snaps to efficiently hang 40 points on the scoreboard. Even with the Chiefs’ low total, the game’s play volume was predictably elevated. Patriots contests ranked fourth in average combined snaps this season, and Chiefs games came in third – the same spot they were during the season’s final month. Despite their improved defense consistently performing better at home, and early-week predictions of Hoth-like temperatures, we can project a reasonably similar snaps pace for the rematch. New England slowed their pace in December, albeit during a particularly AFC East-heavy segment of their schedule. The likelihood of them successfully replicating that deliberate pace, while facing the Chiefs in Arrowhead, is roughly the same as Bill Belichick replicating their Hail Mary defense from Miami. While the narrative holds that the Patriots ground-and-pounded the Chargers into submission last weekend, it isn’t nearly that simple. They certainly found success on the ground – 155 rushing yards and four touchdowns worth – but gained their initial footing through the air. During the 29 offensive plays they ran while the game was within one score, New England passed at a 66% clip – noticeably higher than their seasonal 58% rate. While New England’s mostly short passing game does act as a proxy for handoffs, as Brady completes the high-percentage passes at an uber-efficient rate, the Patriots still operated at the league’s fastest pace when games were close. The Chiefs are only field goal favorites on Sunday. Play volume should not be an issue for New England, who averaged the second-most plays per game this season (67.1). The Chiefs, on the other hand, are not guaranteed to produce a ton of snaps, even if they win the game. Kansas City’s contests were buoyed by their opponents’ play volume (69.3 per game, second most), as they averaged the 23rd-most plays. Of course, no team in the last decade scored more points per snap than the Chiefs. Thanks in large part to a ridiculous number of explosive plays – of which the Patriots have seen more than their fair share – Kansas City hasn’t needed many snaps. While it hasn’t hurt the Chiefs’ overall production, their ancillary weapons are often left out in the cold. The last two meetings with the Patriots resulted in 14 catches, 275 yards and four touchdowns on 20 targets (with two drops) for Tyreek Hill. Of course, Sammy Watkins (four targets, two catches, 18 yards) and Chris Conley (19 yards on one target) did jack squat when Kansas City ran only 52 plays in Week 6. Kareem Hunt, however, did quite a lot in his two games against the Patriots. The now-former Chief rolled up 431 yards from scrimmage and four touchdowns on 27 carries and 10 catches. Damien Williams not only assumed Hunt’s fantasy-friendly role, but he’s potentially ticketed for the Thurman Thomas treatment in a Belichick game plan. In Super Bowl XXV, Belichick allowed Thomas to run up and down the field against the Giants while the defense concentrated on limiting big passing plays. Best known for eliminating what an offense does best, Williams figures to be lower on Belichick’s list than Hill or Travis Kelce. 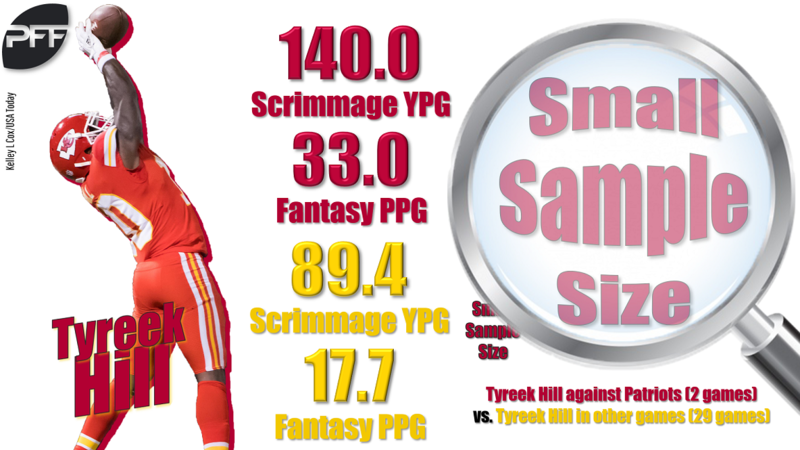 Fortunately for fantasy, the Chiefs have a relatively narrow touch distribution and the Patriots’ more expansive list projects to be supported by play volume. If the (windless) cold scares fantasy investors away from this potential points powder-keg, all the better for us.